New Zealand songstress Kimbra has kept us at rapt attention as she continues to release new versions of her recent music. Songs like "Version of Me" and "Everybody Knows" have gotten the rework treatment, providing fans with new ways to receive her music. 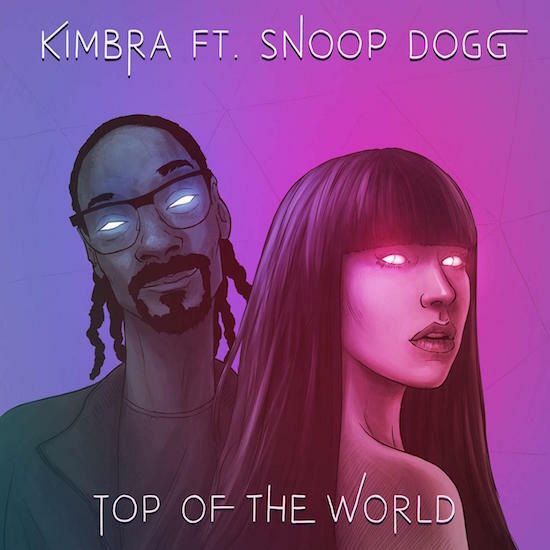 The latest song that the young talent re-releases to the public is "Top of the World," on which she gets a bit of help from none other than Snoop Dogg. Although at first glance it seems like an unlikely pairing, it actually makes sense considering that the song is as close as Kimbra gets to rapping. The Skrillex-produced original had us vibing along to the tribal drums and the confident bars dropped by the singer. For the remix, she does little to the song's original version, opting instead to drop Snoop's verse in towards the end. Unsurprisingly, Snoop dives in headfirst, sounding as if he was always meant to appear on the song. He smoothly and effortlessly fits right in as he makes light work of the track's breakdown. "Kimbra got dope energy, sound and look--which is the reason I was excited to jump on this track with her," he said of his decision to collaborate with the Kiwi. "Unique sound is a rare thing in today's world, however, my homegirl climbing to the top. No pun intended, ya dig?!?!" As previously mentioned, "Top of the World" is just the latest single from Kimbra's third studio album, Primal Heart, to get the remix treatment. Additionally, she will also be dropping two other reworks of the song, one courtesy of Eureka the Butcher and the other from MonoPoly. She is currently touring throughout Australia and New Zealand, with plans to add more dates to her schedule in the near future.